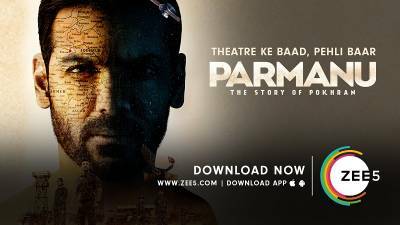 After the successful web debut of Akshay Kumar’s Padman, ZEE5 - India’s largest multilingual digital entertainment destination will be releasing the widely-acclaimed John Abraham-starrer Parmanu - The Story of Pokhran on the platform on Wednesday, 25th July. Inspired by the real-life events of India’s second confidential nuclear test at Pokhran in 1998 under the leadership of India’s Missile Man, APJ Abdul Kalam, the film narrates the tale of Indian Army’s valour and patriotism. After its theatrical release in May 2018, the film will be available exclusively to viewers of ZEE5. Download the App using the special offer till 15th August: 2 months’ subscription @99/- only or @499/- for a year. ZEE5 has a wide repertoire of visual content including movies as well as web series under multiple genres including comedy, drama, thrillers, horror, biopics and so on. And Parmanu now introduces movies celebrating the valour and bravery of the country’s armed forces. “We received a phenomenal response to the web debut of Padman. And given the reviews that Parmanu enjoyed on its release, we are confident that the movie will be a huge hit too. John is known to be an astute businessperson, and his faith in the reach that ZEE5 offers is encouraging,” he concluded. ZEE5 has a rich bouquet of original content in six regional languages along with the latest blockbuster movies. The platform will launch 20 originals in 2018 and will have 90+ shows by the end of March 2019. With over 3,500 films, 500+ TV shows, 4,000+ music videos, 35+ theatre plays and 90+ LIVE TV Channels across 12 languages, ZEE5 presents a blend of unrivalled content offering for its viewers worldwide. With ZEE5, the global content of Zindagi as a brand, which was widely appreciated across the country, has also been brought back for its loyal viewers. Pricing: Freemium pricing model with both free and paid premium content (including Originals) to cater to a mix of audiences. Viewers who subscribe to the ZEE5 subscription pack will get access to the entire library of content at a special offer price of INR 99 per month. ZEE5 deepens its presence in Malaysia with Celcom in partnership with Apigate. Say it with Dramebaaz GIFs!